Established structures are on the verge of breaking apart, ushering in a period of dramatic change. These changes can crash into your life unexpectedly, bringing a much needed wake-up call. It’s time to sweep your life clean. Beliefs may crumble and routines may break down. 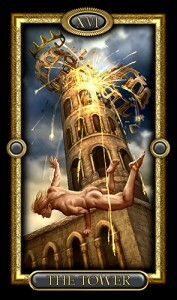 An explosive transformation is at hand, giving the opportunity for a fresh start (whether you want one or not). 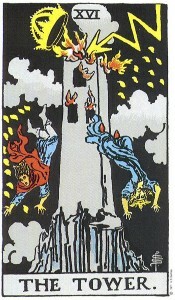 In a reading, the Tower can be a stressful card to receive, especially if you’re not ready to change up the status quo. 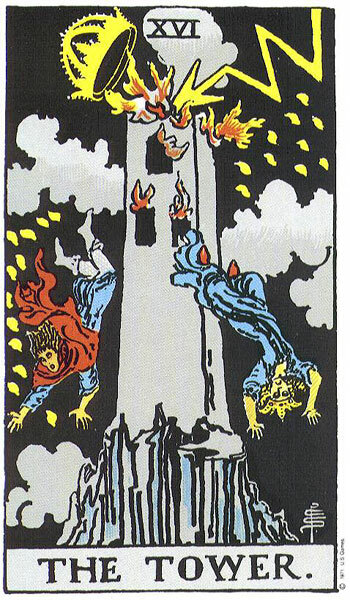 But depending on the cards surrounding it, the Tower could simply mean that an illusion will be dispelled, that you’ll see things in an entirely new light, or that sudden (and positive!) change will be visited upon you.